Interesting article of how to get FreeSurfer meshes into blender so you can do some cool stuff with them. So I was just perusing the webs to think if anyone in the Stata world was trying to do Markdown after an LDA lecture. Link to You and Your Research live talk by Richard Hamming. So I love interactive graphics. I also enjoy 3D graphics, when they are necessary, and RGL suites me pretty well for them. 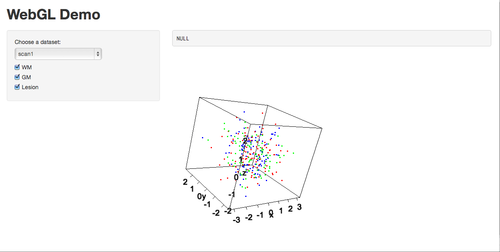 I recently forked a github repo (https://github.com/trestletech/shiny-sandbox), and just made a quick working example of how to make a 3D scatterplot with options of changing data sets, and taking certain types of points out (WM – white matter, GM – gray matter). Try it out here: https://github.com/muschellij2/shiny-sandbox. Hopefully in the future I can get the camera angles and matrix rotation to stay fixed when adding/deleting points. Over the past year I went to the Society for Neuroscience (SfN) conference. If you have never been, it’s a sight (here is a link to the attendance until 2009 – where they had over 30000 in attendance). Also, the poster session is enormous and a labyrinth if you don’t have a plan. One good thing was that they had an app to help organize your schedule. My question is: why not have the ranking of those that put a poster/session on their schedule for new researchers to see the “hot topics”? Also, the ability to follow who is going to what poster/session may help you see friends/colleagues or follow someone whose views you respect on the topics? Obviously it’s easier to ask why they’re not there than to help implement it, but I think these would be the future of conferences, especially large ones.